Hey! 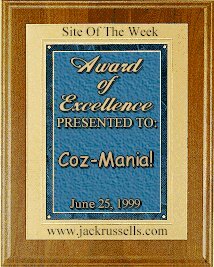 This page was last updated on Friday, August 25, 2000 - no foolin'! These awards were presented to me for this lovely homepage of mine. Since these folks were so kind to come and see my page, won't you visit theirs? Lucky Me!! 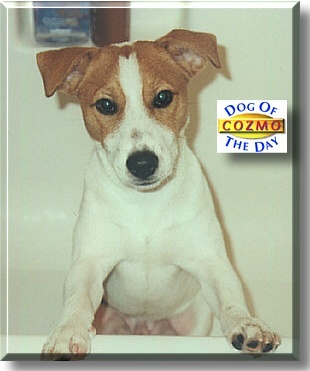 I won this awesome award from the The English Jack Russell Terrier Club Alliance, Inc. (EJRTCA). OhBoy! I am CERTIFIABLE now! Hey - know what? I could win a really BIG prize if you click on the link above and vote for me!!! Please?? Click on my masked photo to see me and other club members! I was named Dog of the Day! Please visit this site and see all the great pets!! She's as sweet as her name, Sugar is!! Look what she gave me!! From Georgina's Winnie the Pooh Page! the week of June 28 - July 4, 1999!! From Stella & Ruby's Homepage - two of the cutest girls in the world! 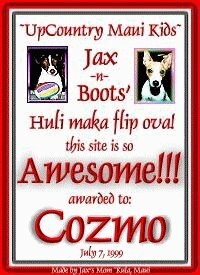 And this is the award that Mommy won for making my site - aren't those Maui Kids nice for recognizing the hooman effort ? Please make sure to check out previous Sites of the Week! I got this cool award from the UpCountry Maui Kids - they are some COOL Jacks! Back to the rest of the stuff!